Tupac Shakur would have been 45 years old had he survived the September 1996 drive-by shooting in Las Vegas. He died at 25 with no children — once saying he feared bringing a son or daughter into “such a corrupt world.” The rapper’s deep devotion to kids, however, was evident both in and out of the recording studio. From Robert “Yummy” Sandifer to Qa’id Teal Walker — the 6-year-old boy from Marin City, California, who died from a stray bullet in 1992 following an altercation between Tupac’s entourage and former acquaintances — to Joshua Torres to Latasha Harlins and countless others, Shakur was a voice for young people who were and are so often ignored by society. What’s the use? / Unless we’re shooting no one notices the youth, he asked in the 1995 track Me Against The World. 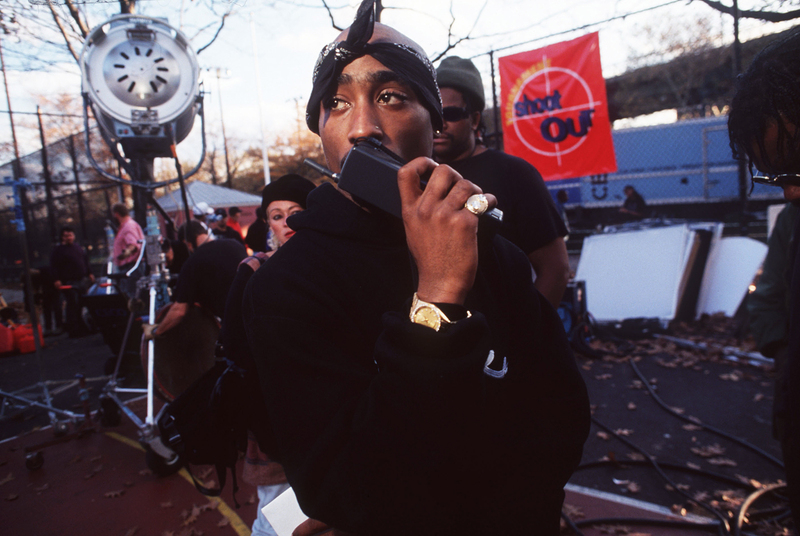 Tupac Shakur on the set of Above the Rim in Harlem, New York. It is Latasha, however, who appears in Shakur’s music throughout his career, even long after his death. Tupac and Latasha were born four years apart. And their spirits seem joined this week, as Latasha makes a brief but emotional appearance in the recently aired second episode of O.J. : Made In America. Latasha was killed by convenience store owner Soon Ja Du in March 1991. Her death, along with the beating of Rodney King that same year, became detonators of the 1992 Los Angeles riots. There was no prison time served by either of the members of the Los Angeles Police Department who beat King, or by Du. “Latasha Harlins, remember that name,” Shakur pleaded on his 1993 sophomore album, Strictly 4 My N—–. “Because a bottle of juice is not something to die for.” On the same album is the track Keep Ya Head Up, a standout pillar in not only Tupac’s catalog, but in hip-hop culture as a whole. Before even uttering the first lyric, the video’s benediction reads “Dedicated to the memory of LATASHA HARLINS … it’s still on.” The 15-year-old who was unlawfully murdered occasionally reappeared in his music, even after Shakur joined her in the afterlife. Rest in peace to Latasha, Lil’ Yummy and Kato / Too much for this cold world to take, ended up being fatal. — 1996’s White Man’z World. Here on Earth, tell me what’s a black life worth / A bottle of juice is no excuse, the truth hurts / And even when you take the s— / Move counties get a lawyer you can shake the s—- … Ask Rodney, Latasha and many more / It’s been goin’ on for years, there’s plenty more / When they ask me when will the violence cease? — 1997’s I Wonder If Heaven Got A Ghetto. Dear Lord if you hear me tell me why / Little girl like Latasha had to die. She never got to see the bullet, just heard the shot / Her little body couldn’t take it, it shook and dropped / And when I saw it on the news how she bucked a girl, killed Latasha / Now I’m screamin’ f— the world, in the end. — 1997’s Hellrazor. Tupac’s most famous mention of Latasha is on 2002’s Thugz Mansion. It was recorded during one of the many marathon recording sessions he had before he died, and was released on the posthumous LP, Better Dayz. Held for six years, his tone was reflective and forgiving. It’s almost as if he’d pardoned Du because Latasha, herself, had convinced him to. Little Latasha sho’ grown / Tell the lady in the liquor store that she’s forgiven, so come home.